The theme discussed here highlights the interactions between a Territory and a major category of actors to its structure, local Elites. During Antiquity, the question of lemovician Elites had hitherto been considered mainly through epigraphic sources, without it being related with the Territory. Elite concept leads implicitly to question the relationship between this population and the territory, through the link between the capital and small towns, and more broadly the relationship between city and countryside. Are Elites from Limoges those of rural areas? In this question lies the whole problem of identification and place of villas on the territory of the city of Lemovices. This territorial dimension of Elites’power in the city of Lemovices is confirmed for the following period, in the course of historical events such as the coronation of Charles l’Enfant. 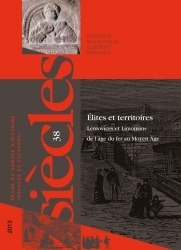 Also, even though Antiquity is chronologically central in our reflexion, the choice was made to analyze the relationship between Elites and Territory in a broader historical perspective, the only way to perceive the changes and continuities during a long period and to confront and enrich the analytical methods beyond the traditional chronological break. La mise en ligne de ce numéro a été effectuée par Isabelle Langlois et Claude Tardif.